We are available for you from 08:00 to 18:00 today. The key differences between the two modes are in the power loss to distance ratio and in their glass core. The Single-mode fibers have lower power loss to distance ratio which means they have the capability for higher bandwidth and much longer distances in transmission. On the other hand, the power loss to distance is much bigger with Multi-mode fibers which results in a smaller distance capability. This is mainly because the Multi-mode fiber light is bouncing off the edge of the fiber’s walls and scattering across the cable resulting in an unequal distribution of light at the far end of the cable because the light photons that went down the center traveled less distance than those that bounced around the cable. This effect is weakened in Single-mode fibers due to the smaller diameter of the core and a narrower laser wave at the center of the fiber. Because the Single-mode fibers have a smaller core and a narrower laser wavelength, they operate mainly at 1310 or 1550 nm wavelengths. The optical transceivers needed are considerably more expensive to produce than the optics needed for Multi-mode fibers which use a bigger core and longer wavelength of light, what naturally sums the costs for the installation up. Knowing which type to use in a given situation is crucial for the whole fiber optic network and future network planning. It is important to know that both Single-mode and Multi-mode fibers are able to handle 10 GB/s speeds. 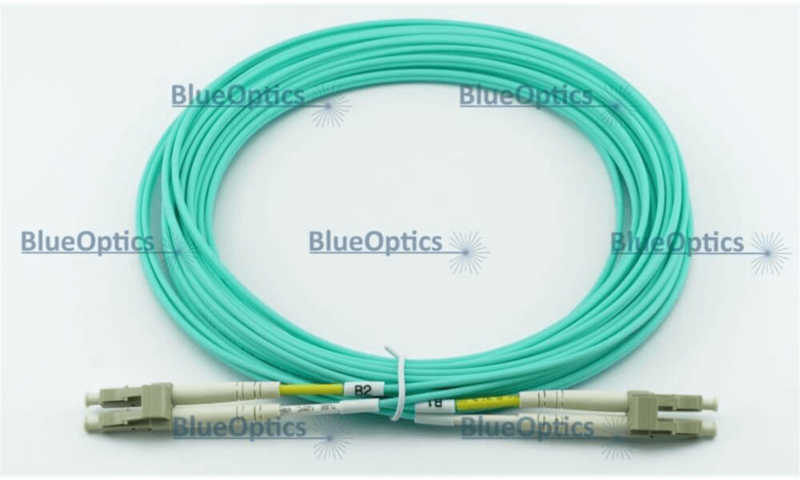 There are four types of Multi-mode fiber cables: OM1, OM2, OM3 and OM4. The letters OM stand for Optical Multi-mode and each Multi-mode fiber has a minimum Modal Bandwidth (MBW) requirement. OM1, OM2, and OM3 are determined by the ISO 11801 standard, which is based on the modal bandwidth of the multi-mode fiber. In August of 2009, 492-AAAD has been released by the Fiber Optic Association, thus defining the performance criteria for OM4. 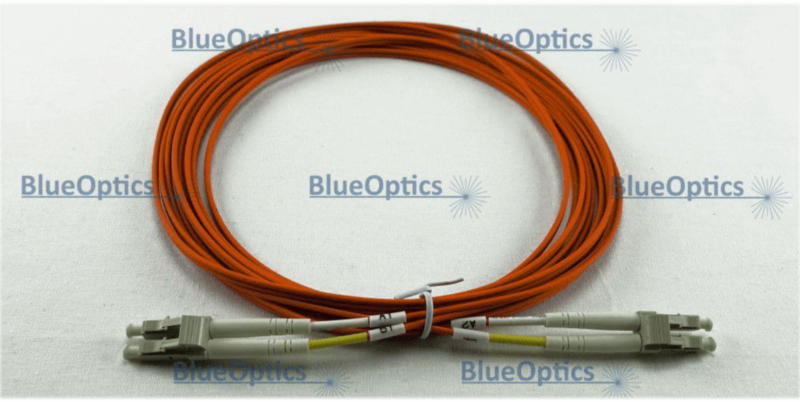 OM1 fiber cables typically come with an orange jacket and have a core size of 62.5 micrometers (µm). It can support 10 Gigabit Ethernet at lengths of up to 33 meters. It is most commonly used for 100 Megabit Ethernet applications. This type commonly uses a LED light source. OM2 also typically comes with an orange jacket. Its core size is 50 micrometers (µm). It supports up to 10 Gigabit Ethernet at lengths up to 82 meters but is more commonly used for 1 Gigabit Ethernet applications. Like the OM1, this type also uses a LED light source. OM3 typically comes with a turquoise (aqua) color jacket. Like the OM2, its core size is 50 micrometers (µm). OM3 supports 10 Gigabit Ethernet at lengths up to 300 meters. Besides OM3 is able to support 40 Gigabit and 100 Gigabit Ethernet up to 100 meters, however, 10 Gigabit Ethernet is most commonly used. Unlike OM1 and OM2, OM3 uses 850nm VCSELs which means vertical cavity surface emitting lasers. OM4 also typically comes with a turquoise or magenta color jacket. It is a more advanced and improved version of OM3. It also uses a 50 micrometers (µm) core but it supports 10 Gigabit Ethernet at lengths up to 400 meters and it supports 100 Gigabit Ethernet at lengths up to 150 meters. Just like the OM3, OM4 uses 850nm VCSELs. Because the OM3 and OM4 fibers use vertical cavity surface emitting lasers (VCSEL) they are far more superior to the OM1 and OM2. 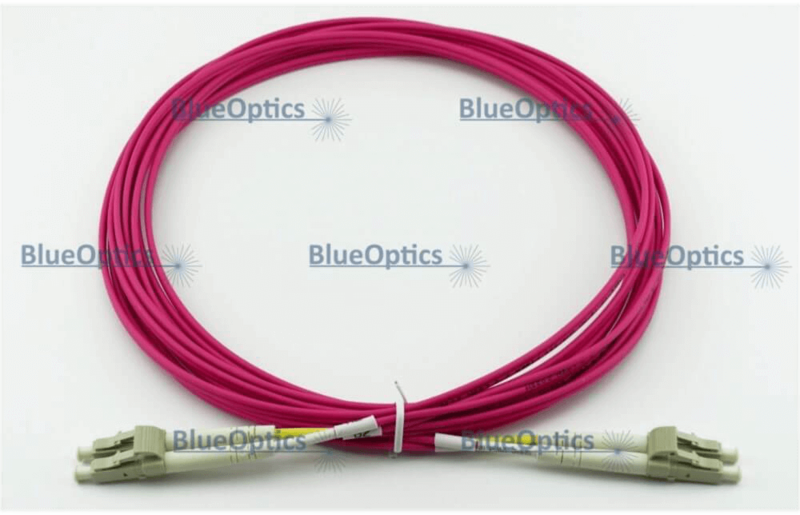 The LED source of the OM1 and OM2 is only capable of transmitting hundreds of modes of light through the cable, while OM3 and OM4 fibers are specifically made and optimized for vertical cavity surface emitting lasers that use fewer modes of light. The other key characteristic that differentiates these types is the inability of the LED source to be turned off and on fast enough to support higher bandwidth applications, while the VCSELs are able to support above 10GB/s modulation. This is the main reason why OM3 and OM4 are the only fibers included in the 40 GB/s and 100 GB/s Ethernet standards. Even though OM3 and OM4 are fairly similar there is a big difference in their internal build allowing OM4 to reach greater distances. The key difference is the higher megahertz bandwidth, 4700 MHz, of the OM4 compared to the 2500 MHz of the OM3. This will eventually allow for longer transmission distances in favor of OM4. It’s crucial to know the distance of the fiber run in order to exactly know which type of fiber and fiber equipment should be used.